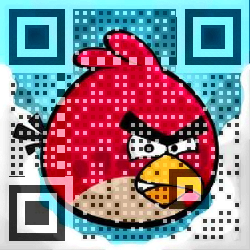 In the article Color QR Codes Done Right (with the corresponding tool to try it yourself), I’ve tried to convince you to create your color QR codes in a way that keeps them easily scannable. This week, I’ve discovered Visualead, a startup that is currently in Public Beta, that lets you combine any artwork with a QR code. Graphically, they have nailed it. They seem to have found out that only the center of each element (“black” or “white” square) really counts, and that the rest of the area can be any color. This must have taken lots and lots of testing with all sorts of scanners, since it certainly doesn’t follow from the QR code standard that this would work. By only encoding the actual information in the center of each element, they can keep most of the original illustration intact, so that the QR code really blends in. Very nifty! A single example should be enough to convince you. Note that they also seem to have found out that the indicator structures in a QR code (see QR Codes) are very important, and shouldn’t be messed with if you want to keep your code easily scannable. Have a look at their site for (much) more examples. They have some really cool designs!